It's been a long day, starting with being woken by the sun quite early, around 05:00. We had a good, solid sleep up to that point, then dozed in a bit longer until we could bear it no more and got up to prepare for breakfast. Jo cooked us up eggs and toast by request at 08:30, M. having a fried egg and me a poached, with sausages and mushrooms on the side. While she cooked we ate cereal: muesli for me and corn flakes for M.
With brekky done, we packed our bags and loaded the car. We paid for the room and gave back the keys, but left the packed car there while we walked back into Winchester for another look around the town before leaving. Bert and Jo said they would probably be gone when they returned, as they had a day trip planned. We wandered down to the High Street and over to the City Museum, which we hadn't seen yesterday. It opened at 10:00, giving us a few minutes to kill, so we bought some coffee for M. and some fruit for the day at a fruit stall, and some batteries for my camera flash (I hadn't wanted to carry batteries overseas when I could easily buy them here), then we went back to the museum. It was three storeys tall in an old stone building. The lady at the entrance advised us to start at the top and work our way down, since the exhibits were arranged chronologically that way. The top floor contained Roman era artefacts from when Winchester was a small Roman settlement, including some beautifully preserved floor mosaics, stone columns, bronze ornaments and tools, and lots of coins. 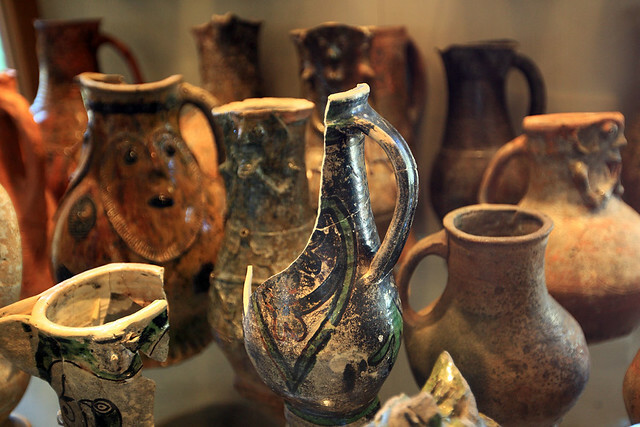 The middle floor contained Anglo-Saxon objects, up to Norman era artefacts. The ground floor contained displays of Georgian and Victorian era shops, including a fully decked out apothecary and a tobacconist. The museum was well put together and had a wealth of activities for kids to do, ranging from three-dimensional jigsaws of replica archaeological relics to brass plaques to make rubbings from, to racks of Roman, Anglo-Saxon, and Edwardian clothes to try on. It was a shame the clothes were sized to fit kids, but I managed to squeeze on a Dickensian urchin hat for M. to take a photo. There was also a fur-lined woman's bonnet which she made me try on for a photo, and of course at that point the guy who worked at the museum came in and saw us. Far from being upset, he actually encouraged me to try on some of the other hats! With that we said goodbye to Winchester and took the walk back up the hill to our car. On the way, and once in the car and heading out of town, we noticed dozens, if not hundreds of uniformed schoolkids hanging out in the park or walking down the streets. It being around 11:00, we wondered if perhaps they should have been... I don't know... in school? We'd seen similar things yesterday with large numbers of kids in uniform wandering the streets during school hours. We drove west from Winchester, through the village of Stockbridge to Salisbury. There we parked in a Park and Ride facility on the edge of town and caught the bus into the middle of this ancient town. When we saw how narrow and choked the streets were in the centre of town, we were very grateful we'd left the car back at the Park and Ride! The bus dropped us off near the market square, where the weekly Tuesday market was in progress. We did a quick circuit of the stalls, which were selling all sorts of things from fresh meats, cheeses, fruit and veg, to clothing, electronic gizmos, and one stall full of "Ped-Egg" foot scrapers ("as advertised on TV"). He was actually doing a brisk trade as we saw when we stopped at an adjacent hot food stall for some lunch for me. The stall was selling various sausages and meats, plus chips and stuffing, which was being fried by itself on the hotplate. I ordered a "roast pork, stuffing, and chips", which came piled high on a styrofoam plate - enough for a substantial lunch. We sat at a table in the shade of the mobile kitchen van and relaxed out of the hot sun while I ate it. 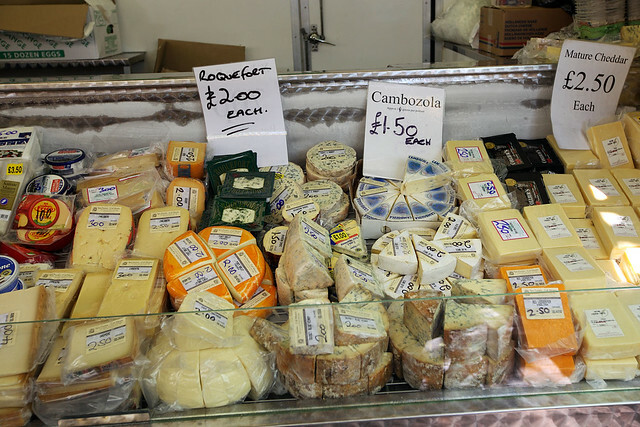 M. meanwhile ate a cheddar and watercress scone that we'd bought at a bakery stall a few minutes earlier. We'd bought two of the scones since they looked good and I wanted to try one too, but the pork and chips was so substantial that I didn't want the scone any more! 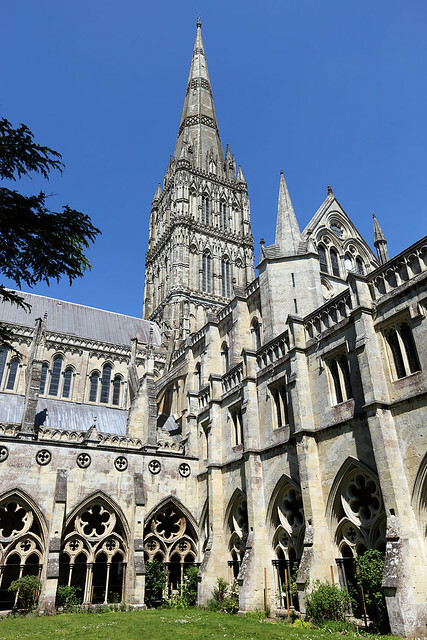 The next stop was Salisbury Cathedral, so we could get in out for the sun for a while. M. stopped in a shoe shop to try on some shoes on the way. After some confusion with the shoe sizes (which vary internationally) and M. trying on a shoe more suited to a... person with huge feet - it turned out they didn't have her size in the style she liked. We made it to the cathedral by passing through a medieval gate house - part of the wall surrounding the cathedral close and still locked every night at 23:30 and only opened again at 07:00. 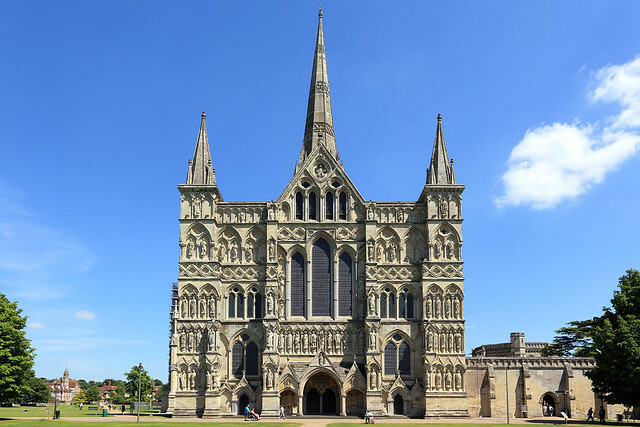 The cathedral was massive, with an enormous spire soaring much higher than Winchester Cathedral, but it was not as long as Winchester's. The northern transept exterior was entirely covered in scaffolding, presumably for restoration works, but the overall impression was still amazing. We entered the cathedral, paying the £5 suggested donation to do so. The first thing we noticed was that this was much more touristy than Winchester Cathedral, with several large groups of people - some school students - entering around us and milling about in the cavernous interior. We had to dodge the crowds in a way we never had to do at Winchester. The first thing to look at was a contraption consisting of various large cast iron gear wheels hooked to stone weights by long ropes that reached up to the ceiling above. The wheels turned in a stately fashion, governed by a toothed escapement. 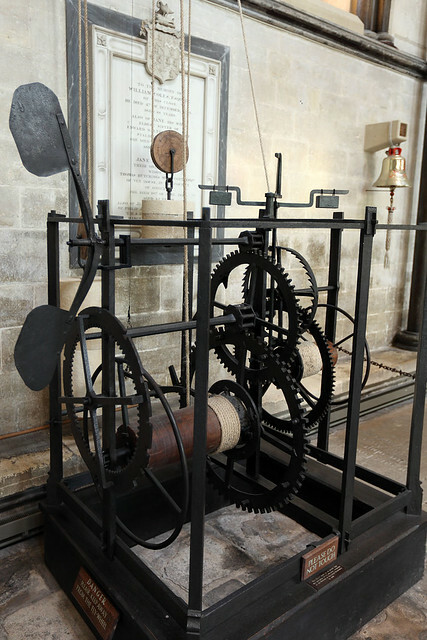 This device - in a metal frame about a metre cube - was a clock, purportedly the oldest still operating clock in the entire world. It had no face and merely kept time by striking a bell on the hour. Nonetheless, it was an impressive piece of functional history. Into the main aisle of the cathedral and we were greeted with a feast of intricate stained glass - much more and more impressive than any in Winchester. 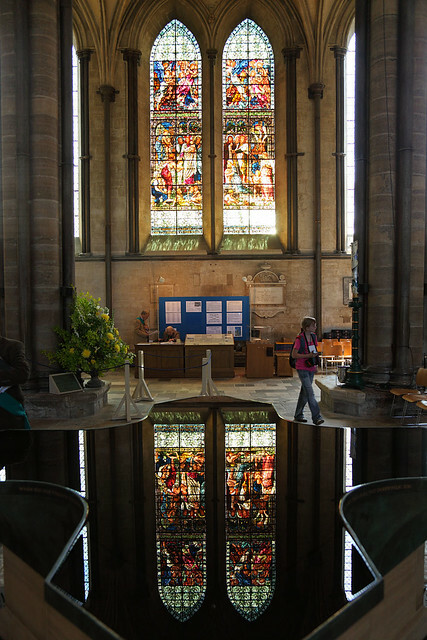 A font of flowing water formed a perfect reflector for a particularly impressive window (that looked relatively modern) on the south wall. 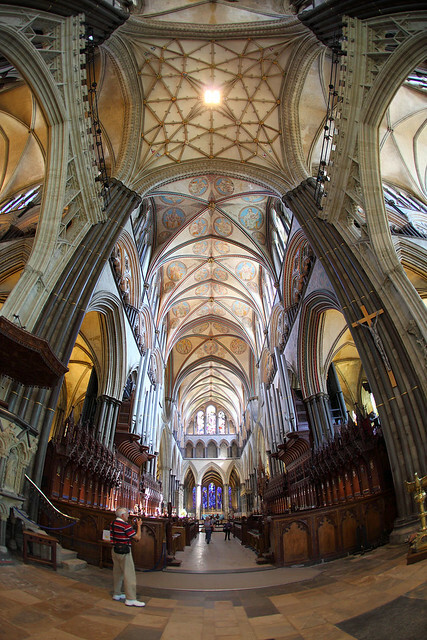 The interior was more open than Winchester, with no quire to block the view all the way down the aisle, past the high altar, and to a large dark purple stained glass window in the eastern wall. We toured the main building, taking in all the detailed carvings, monuments, and resting places of various bishops and so on. Then it was out a southern door to the cloisters, which enclosed a grass courtyard from which we had impressive views of the exterior of the cathedral spire, sunlit from the south. Off the cloisters was the chapter house, which holds an impressive collection of gold and silver religious icons and vessels. It also contains one of just four of the original copies of the Magna Carta left in existence, made in 1215. This is supposed to be the best preserved and most artfully crafted copy, being done by a scholar in one hand. (The other copies are by scribes an the writer changes several times down the page.) A lady gave us details of the history of Magna Carta and explained the physical properties of the parchment and the ink. We got a good close look at the historical document, shielded only by a single sheet of glass only a few centimetres above it. Once done marvelling at this we returned to the cathedral to finish our circuit and exit back into the heat of the day. It was only about 27°C, but the sun was intense when we couldn't find shade. We stopped off in a Starbucks to get an iced coffee for M. and some cold water for me. The rest off our feet was good too. Then we walked back through the market to the Park and Ride bus stop, where a bus was waiting to leave just as we arrived. 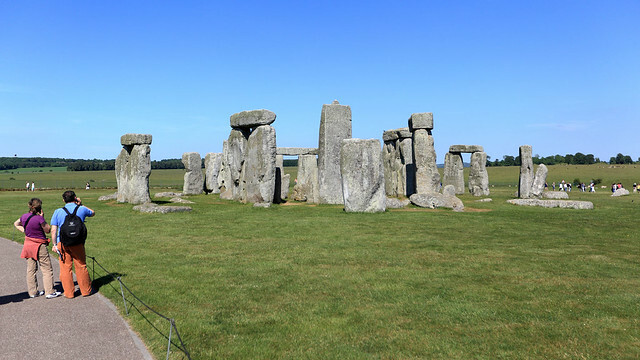 The bus took us back to the Park and Ride and when we got off I asked the driver the best way to go to get to Stonehenge. He pointed the way on a map leaflet which he gave to me and I thanked him for the help. We used the toilets at the bus stop and then returned to our car, which was hot from sitting in the sun. 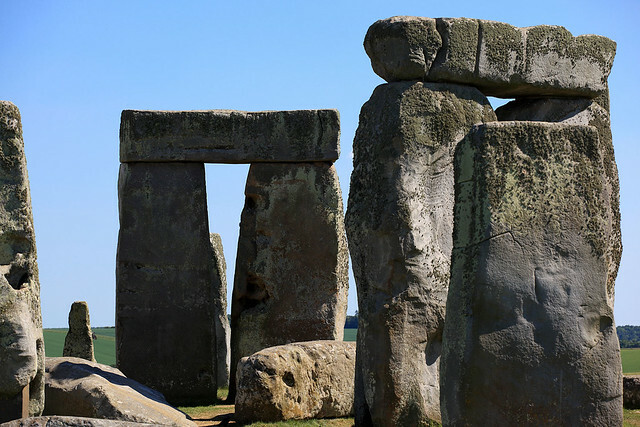 With the air conditioning on high, we took the route indicated by the bus driver and got on the road to Stonehenge. It wasn't long before the stone monument abruptly appeared as we crested a hill. We took the turnoff to the car park, which was swarming with tourists, cars, and coaches. The stones themselves on the other side of the road were surrounded by several hundred, perhaps a thousand or more, people milling about and admiring the ancient site. We paid our £6.60 each and entered the site. 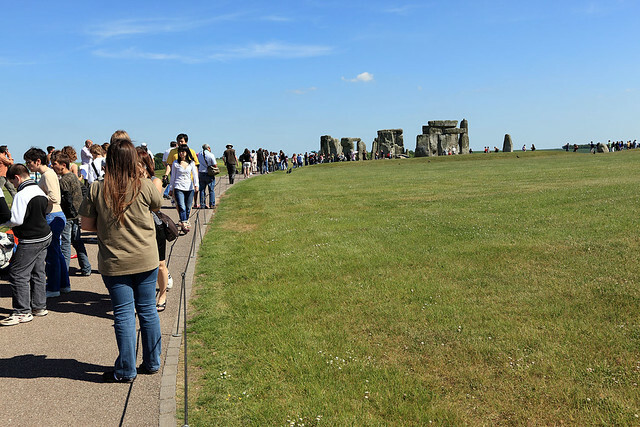 We opted not to get the free audio tour (I dislike those things) and took our own time to walk around the stones on the provided path. There were several groups of foreign school students - most noticeably French - doing assignment sheets with their teachers while camped at various points within the walk circuit. Of course there were also lots of Americans, plus tourists from a host of other countries. M. got a few of them to take photos of us in front of the stones, while we were asked in turn to take shots of a few other people. The stones were very impressive even though we couldn't get up very close to them. Black birds circled and leapt all over them - I think they were ravens. Moss grew on the stones, and you could tell they'd been there a very long time. 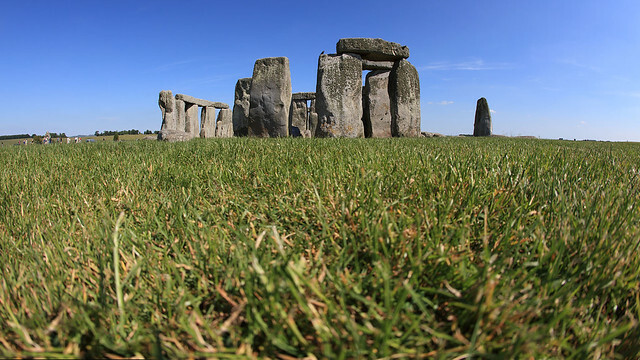 Despite the crowds of people, it was easy enough to get spots on the edge of the path with nothing between us and the stones, and admire the impact they made on the grass plain landscape. We made our way around the site slowly, despite the hot sun. A breeze was blowing across the plain, making it bearable, but still it wouldn't have been wise to stay in the direct sun for long. But the stones were intoxicating and I paused frequently to take photos from lots of different angles. The direct sunlight was harsh and caused bright highlights and dark shadows, but it was the best we were going to get since the site isn't open around sunset or sunrise. So we made the most of it and spent probably close to an hour there. After leaving the stones, we contended with the inevitable gift shop, where M. bought me a souvenir T-shirt with an atrocious pun on it ("Stonehenge Rocks"). Then we climbed back into the hot car and took to the road. The general idea was to head south-west towards Cornwall and try to avoid main through roads if we could. After some minor trouble getting our bearings we eventually found the B390 and followed it and a succession of other minor roads until we entered Dorset. It was starting to get late so we pulled into the small town of Sherborne and followed signs to the Eastbury Hotel - a hotel in a rambling Georgian house. We got the "Bluebell" room on the top floor in the garret for £80, up a very steep and tight staircase that turns 180° as it climbed. The room was large and comfortable and the sight of a new shower was wonderful. We didn't carry our bags in, settling for taking in toiletries and a change of clothes. The first order of business was finding dinner. We walked into the centre of the town and found a friendly looking pub called the White Hart. It had a French special for dinner on Tuesdays and I chose the fish dish and a lemon tart. 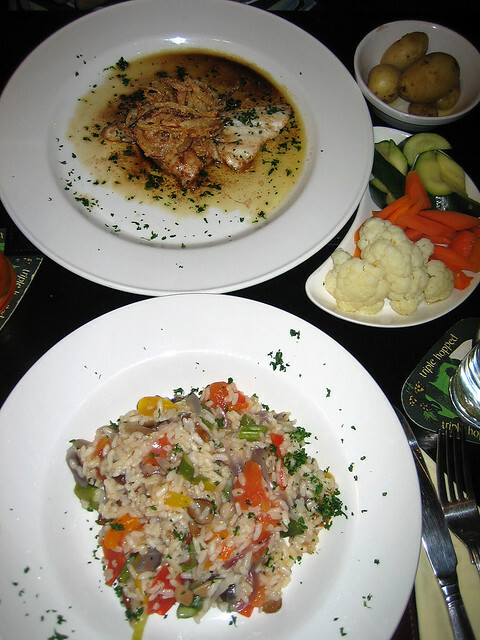 The fish was presented in a butter sauce and piled high with crispy fried onions, accompanied with baked baby potatoes and steamed veges. It was delicious. M. had a vegetable risotto. She also bought a Magners cider for me to try, which was very nice. 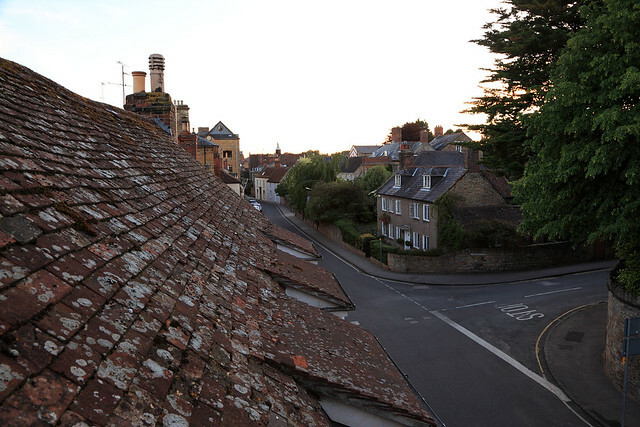 After eating, we walked down the main street in the evening twilight, with the bells of the Sherborne Abbey ringing loudly across the town. We returned to our room and had lovely showers to clean ourselves off and freshen up before collapsing into bed. Last updated: Friday, 18 January, 2019; 15:56:23 PST.